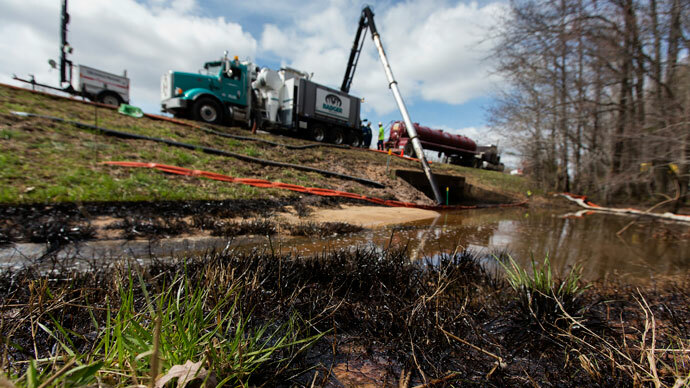 The ExxonMobil oil spill in Mayflower, Arkansas is getting worse: more than a week after Canadian tar sands erupted from a pipeline, residents of the small town say area wetlands are becoming polluted with the crude. 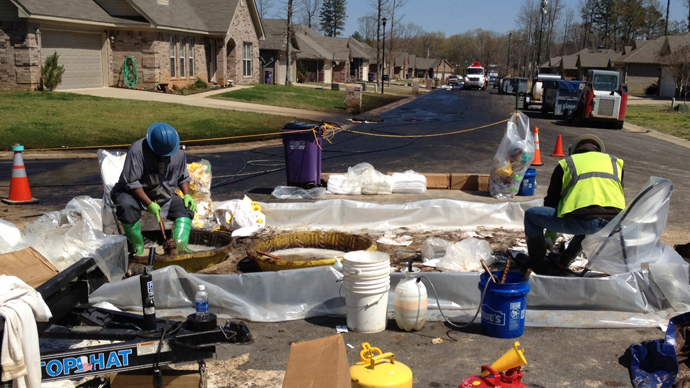 Over 20 homes in Mayflower were evacuated shortly after the a leak in Exxon’s Pegasus pipeline on March 29, but the company’s attempt at correcting the disaster has apparently only made things worse. Activists with the group Tar Sands Blockade went to rural Arizona over the weekend to document the oil spill, and discovered that power washers used by Exxon to clean up the town has moved the crude into nearby wetlands. 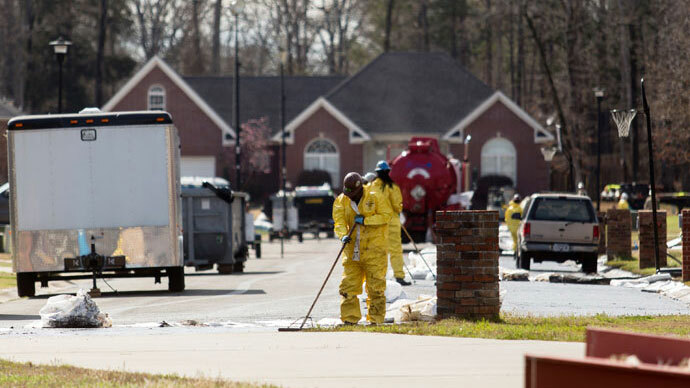 Exxon agents and law enforcement officers have kept the affected area largely on lock-down since the spill was spotted a week and a half ago, and a no-fly zone in the vicinity has made monitoring the damages near impossible for environmentalists. Tar Sands Blockade activists managed to make their way through the woods shortly before sundown over the weekend, though, and were able to get an up-close look at how severe the spreading actually is. “It was just before sunset, and most of the workers had gone home. We had tried to access this area before but always been kept out by workers and police,” the group says. Once they made it to the wetlands, there they discovered that oil power-washed through the city’s storm drains have emptied out into an area that would normally be inhabited by a number of wildlife species. 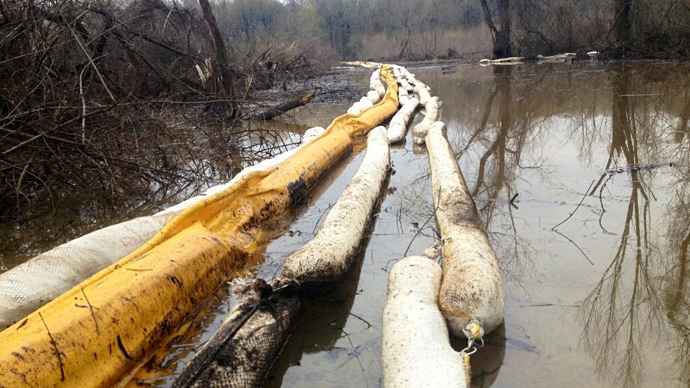 During their on-the-ground investigation in the swamp, the activists also located what is believed to be a section of the Pegasus pipeline that has been outfitted with a clamp. “There are multiple pipelines in the area and we can’t absolutely verify that this is Pegasus, but we compared it to photos of other oil pipelines built in the 1940s and they are similar,” they write. “Do you think that this pipe should be carrying heated, pressurized, corrosive tar sands bitumen?” asks the group alongside a photograph of the archaic-looking pipeline. And while animals that call those wetlands home are the ones that are feeling the effects of the spill now, they aren’t alone. Tar Sands Blockade has been conducted interviews with Mayflower residents who have since developed a number of health issues in the days since the March 29 accident. 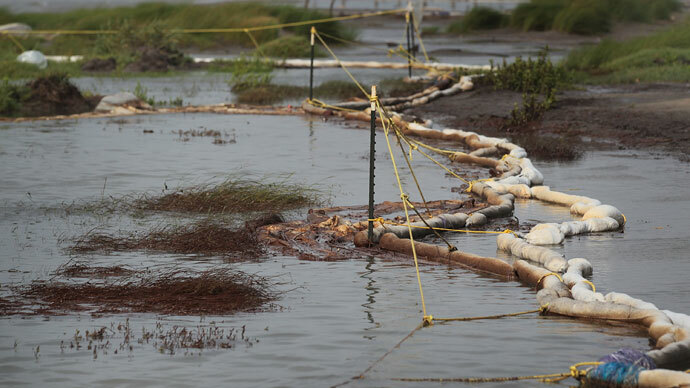 Formally, ExxonMobil told Mayflower residents that the oil never made it to Lake Conway. 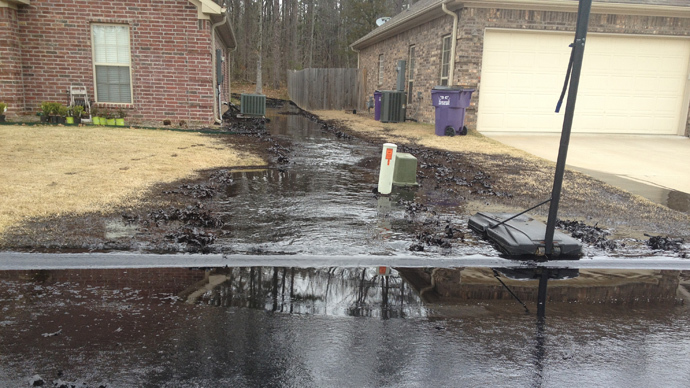 Those that live in the area, however, say oil has indeed been “flowing” into the body of water since last week’s spill.